"Why, this is very midsummer madness." Before he became well known in the US with his excellent film version of Henry V, Kenneth Branagh made a splash in England with the debut of the Renaissance Theater Company. 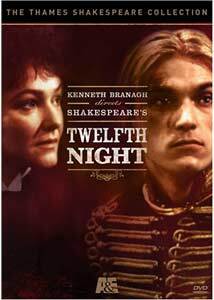 Founded in 1987, the company began with a play by Branagh that flopped, but the company struck gold with their third production, a staging of the beloved Shakespearean comedy, Twelfth Night. Thames TV preserved the production for broadcast, and now it is the latest release in their Thames Shakespeare Collection line. It's a solid, enjoyable production, though some will be put off by the emphasis on the more negative aspects of the play and its characters. The plot, as with many of Shakespeare's works, is fairly standard, as it uses a bundle of character types and plot devices previously seen, but Shakespeare of course worked his alchemy on them to create something special. The play begins with Viola (Frances Barber) surviving the sinking of her ship, and going into the service of the local duke, Orsino (Christopher Ravenscroft), while she mourns her lost twin brother, Sebastian. Orsino loves Olivia (Caroline Langrishe), who mourns her own dead brother, and doesn't love Orsino. Viola, now posing as the boy Cesario, is sent by Orsino to woo Viola on his behalf. Viola, however, has fallen in love with Orsino, and in turn sees Olivia fall in love with her (or him, as Olivia believes). Throw in the fact that Sebastian didn't die, and a subplot involving Olivia's stuffy steward Malvolio (Richard Briers), and you have the ingredients for some amusing comedy. Much of that comedy revolves around a general cruelty, though, largely perpetrated on Malvolio, who, while certainly a prig and killjoy, is hardly deserving of the humiliation he receives from Toby (James Saxon) and company. Toby, Olivia's cousin, is really the villain of the play, if we want to assign one. He's a boorish drunk and a creep, manipulating his companion, the hapless Sir Andrew Aguecheek (James Simmons), in order to bleed his wallet. In this staging, Toby's glee in driving the plot against Malvolio lacks any good-spiritedness to make it the least bit forgivable, and his final, drunken sending off of Andrew is venomous in its contempt. As Viola/Cesario, Frances Barber seems a bit old to believably carry the role onscreen, though the stage may have been another matter. She's a capable actress, though she doesn't have much chemistry with Orsino. Orsino is one of the characters generally shorted much characterization by the play, and that's not much different here. Christopher Ravenscroft never raises his emotion level beyond torpid, for the most part. One of the best roles in the play belongs of course to Feste, and Anton Lesser fills it admirably, even doing a good job on the songs. Like the production as a whole, he plays Feste with an edge, hinting at darker things than one might expect in what is billed as a comedy. Branagh hailed Richard Briers' performance as Malvolio as being the center of the production, and Briers does indeed turn in a marvelous performance, especially adept at the comedic moments and otherwise good in his dramatic moments as well. Malvolio's first attempt to smile is hideously funny. Abigail McKern deserves mention for her performance as Maria, and everyone else turns in solid performances. As noted, this is a filmed version of a stage production, so it obviously looks very stagy. Paul Kafno, who filmed it, plops his camera down and dispenses with anything flashy. There are a lot of medium shots, duplicating in some ways the play-going experience, with nothing to distract from the staging or give the impression that this was anything but a hands-off approach. Patrick Doyle wrote the music, used mainly, aside from Feste's songs, to mark the beginning and end of scenes. The songs are nice enough, and even include an adaptation of a Paul McCartney song. He otherwise had nothing else to do with the music, so take the box credit "Music by Sir Paul McCartney and Patrick Doyle" with a grain of salt. Branagh's staging doesn't take any huge chances, relying on the actors and the play to do the work, and for the most part, it succeeds, with some quibbling about the actors being inevitable. Branagh's choice to emphasize the melancholy and darkness in the script is one that I can't especially argue with, and his choice to set his production in what he describes as a Victorian "Dickens Christmas" works for the most part, though the monochrome set gets a bit wearying on the eye after two-plus hours. All in all, I've seen much worse Shakespeare, and I've seen better Shakespeare. I imagine this would have worked better on stage, without the distancing of a camera, but overall this is a solid production. A general, if not ecstatic, recommendation then. Image Transfer Review: Shot on video for British television in 1988, this looks about as you might expect, which is fairly dull and drab. Branagh's staging uses primarily whites and blues, which adds to the overall monochrome dullness of the show on video. It isn't appalling quality, given the source, but nor does it look stellar. It's acceptable, no more, no less. Audio Transfer Review: Given the dialogue-driven nature of the production and the lack of much sound work beyond music, the Dolby 2.0 track doesn't have a whole lot to do. The dialogue is all clear and comprehensible, and the music comes across fairly well. It's not a showy track, but it's fine. Extras Review: The only extra of note is an interview with Kenneth Branagh (20m:35s), in which Branagh discusses his feelings about the play and his staging of it. It's fairly interesting, and well worth viewing if you're a fan of Branagh and/or the play. Also included is a timeline of Shakespeare's life and plays. A solid representation of a well-received stage production, A&E's DVD of Twelfth Night is a generally no-frills affair that allows the play to speak for itself, which it does fairly well. Given the source material, the video and audio are nothing exciting or showy, but this is worth a look if you're a fan of Shakespeare and Branagh's productions of the Bard.